Does Leaking Secrets Damage National Security? 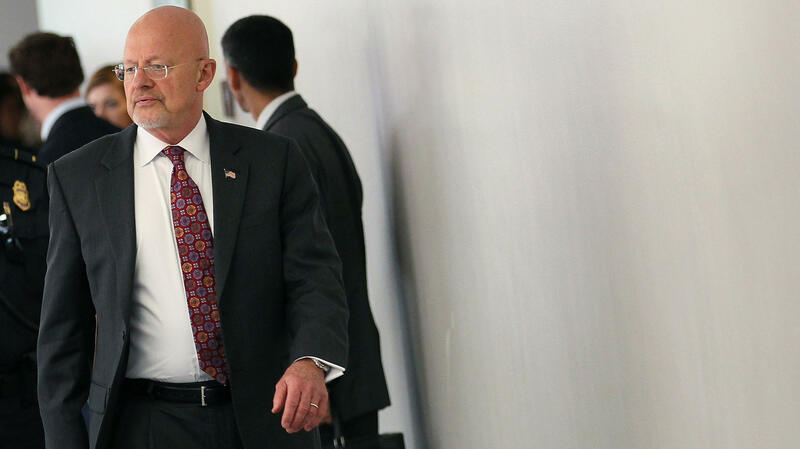 James Clapper, director of national intelligence, leaves a closed-door joint meeting with the Senate and House Intelligence committees on June 7. Clapper ordered an inquiry into security leaks to be concluded next week. Last week's assignment of two federal prosecutors to investigate disclosures of national security information might have been the first shot in a new war on leaks. The director of national intelligence is expected soon to announce new measures to fight unauthorized disclosures, and some members of Congress say it could be time for new anti-leaking laws. The moves are motivated by a concern that recent revelations about the successful penetration of an al-Qaida cell in Yemen, U.S. policies regarding drone aircraft strikes, and a White House-authorized cyberattack against Iran have jeopardized U.S. national security. But advocates of open government fear an overreaction. "Members of Congress in both parties have adopted an extreme knee-jerk position that presumes any and all disclosure of classified information is always wrong," says Steven Aftergood, director of the Project on Government Secrecy at the Federation of American Scientists. "That just doesn't fit the experience of those of us who gather or consume news." Not all leaks of classified information are criminal. A successful prosecution for disclosing secrets has to prove violation of the 1917 Espionage Act and show that the leaker realized it could harm the United States or help a foreign government. In fact, there may be times when government officials talk about an otherwise secret operation for strategic reasons. With the killing last year of Osama bin Laden, the Obama administration knew the whole world would be drawing conclusions. Christopher Paul, a strategic communications expert at the Rand Corp., says it made sense under the circumstances to divulge some details, to take charge of the raid narrative. "It's forethought and planning," Paul says, "recognizing that, 'Gee, here's an operation that's going to send a message. What message do we want it to send? How can we present it in such a way or talk about it in such a way that it's closer to our broader strategic objectives?' "
A top concern is to protect intelligence sources and methods or maintain secrecy about an ongoing operation. Officials also worry that foreign governments will be less inclined to collaborate with the United States if they suspect that American officials can't keep a secret. The possible motivation for leaks varies. Government whistle-blowers may divulge information to reporters to force a change in some policy or operation to which they object, arguing that people have a right to know what their government is up to. In some cases, officials may talk about semi-secret operations in order to boost public understanding of a mission. "Classified information [may be] disclosed not only to undermine or challenge policy, but to explain it, to defend it and to interpret it for the public," Aftergood says. Some Republicans suspect that recent disclosures were motivated by the desire of administration officials to boost President Obama's political standing. "There are [also] people who leak because the process of being courted by a reporter is so flattering," says Joel Brenner, a former general counsel at the National Security Agency. "It so increases peoples' sense of self-importance that they will want to talk." Brenner says a public interest may possibly have been served by a recent New York Times story about how the president and his staff choose the targets of missile strikes from drone aircraft. He draws a clear line, however, between that story and the accounts of how a secret al-Qaida agent was instrumental in the discovery of a bomb plot against the United States and of a decision by Presidents Bush and Obama to use a cyberweapon to damage nuclear facilities in Iran. "With a question of broad public policy like drone targeting, people can challenge it," Brenner says. "But spilling information about the takedown of a bomber in Yemen or a computer network operation against the Iranians is a different matter." The Director of National Intelligence, James Clapper, was so incensed by stories about the Yemen bomber that he ordered an inquiry into the leak, due to be concluded next week. A senior intelligence official says Clapper is now poised to authorize lie-detector tests across all intelligence agencies if necessary to stop leaks. The polygraph exam would include a question about whether the test subject has discussed classified information with a member of the press. The official says Clapper is also prepared to establish a task force with the responsibility of tracking down leaks anywhere within the intelligence community. The task force would include inspectors general from each intelligence agency. The next question is whether Congress moves to criminalize leaks of classified information, a move some members have suggested. Aftergood says he is worried. "If Congress were to assert a hard line that each and every disclosure of classified information must be punished, a lot of the news-gathering and news-production process as we have known it would have to shut down," he says. Congress passed just such a law in 2000, only to have it vetoed by President Clinton. In a statement, Clinton said he objected to a "badly flawed" provision that would have made the unauthorized disclosure of classified information a felony. Clinton said that though well-intentioned, the provision is "overbroad and may unnecessarily chill legitimate activities that are at the heart of a democracy." It's MORNING EDITION from NPR News. Good morning. I'm David Greene. More now on the controversy over leaked information of national security information. A controversy set off by reports of a kill list of terror suspects. Two prosecutors have been appointed to investigate whether laws were broken in leaks about cyberattacks on Iran and the decision making behind drone strikes. The director of national intelligence is expected soon to order new measures to fight leaks. And some members of Congress are proposing new anti-leaking laws they say will protect national security. But as NPR's Tom Gjelten reports, the issue is not clear cut. TOM GJELTEN, BYLINE: Here's an important point: leaking classified information is not necessarily against the law. A prosecutor has to prove the disclosure harms the United States or helps a foreign government. There may be times when an administration talks about an otherwise secret operation for legitimate strategic reasons. With the killing last year of Osama bin Laden, the Obama administration knew the whole world would be drawing conclusions. Christopher Paul of the Rand Corporation says, under the circumstances, it made sense to divulge some details just to take charge of the narrative. CHRISTOPHER PAUL: Recognizing that, gee, here's an operation that's going to send a message. What message do we want it to send? How can we present it in such a way or talk about it in such a way that it's closer to our broader strategic objectives? GJELTEN: A top concern here is to protect intelligence sources and methods, maybe an ongoing operation. Officials also worry some foreign government won't trust the U.S. any more if its secrets aren't kept. But there's also the need for people to know what their government is up to. Steven Aftergood, a secrecy expert at the Federation of American Scientists, notes that government spokespersons, after careful consideration, routinely let some secrets come out. STEVEN AFTERGOOD: Classified information is disclosed not to undermine or challenge policy, or at least not only for those reasons, but to explain it, to defend it, and to interpret it for the public. GJELTEN: Some other cases: Joel Brenner, a former general counsel at the National Security Agency, notes that government whistleblowers may leak information to reporters in order to force a change in some policy or operation. JOEL BRENNER: And then there are people who leak because the process of being courted by a reporter is so flattering, it so much increases peoples' sense of self-importance. BRENNER: Yeah, oh, definitely. They'll want to talk. GJELTEN: The latest controversy involves disclosures about how the president and his staff choose the targets of missile strikes from drone aircraft, also the use of a secret al-Qaida agent to uncover a bomb plot. And, finally, a decision by Presidents Bush and Obama to use a cyberweapon to damage nuclear facilities in Iran. Joel Brenner says he sees a possible public interest only in the case of U.S. drone policy. BRENNER: Spilling information about the takedown of a bomber in Yemen, on the other hand, or a computer network operation against the Iranians is a different matter. GJELTEN: The director of National Intelligence, James Clapper, was so incensed by leaks about the Yemen bomber that he ordered an inquiry. An intelligence official says Clapper is now posed to authorize lie detector tests across all intelligence agencies if necessary in order to stop leaks. And he's expected to have the examiners routinely ask testees whether they have discussed classified information with a member of the press. Steven Aftergood, the secrecy expert, worries about an overreaction - by outraged members of Congress, for example. AFTERGOOD: If Congress were to assert a hard line that each and every disclosure of classified information must be punished, a lot of the news gathering as we have known it would have to shut down. GJELTEN: In 2000, Congress passed just such a law. But President Clinton vetoed it, saying it could have chilled legitimate activities that are at the heart of democracy.